Alongside their annual festival of adventurous music, Supersonic producers Capsule have recently been working with Birmingham Museums Trust to present an exhibition of mechanical instruments. This took place at Millennium Point, Birmingham, in early June. 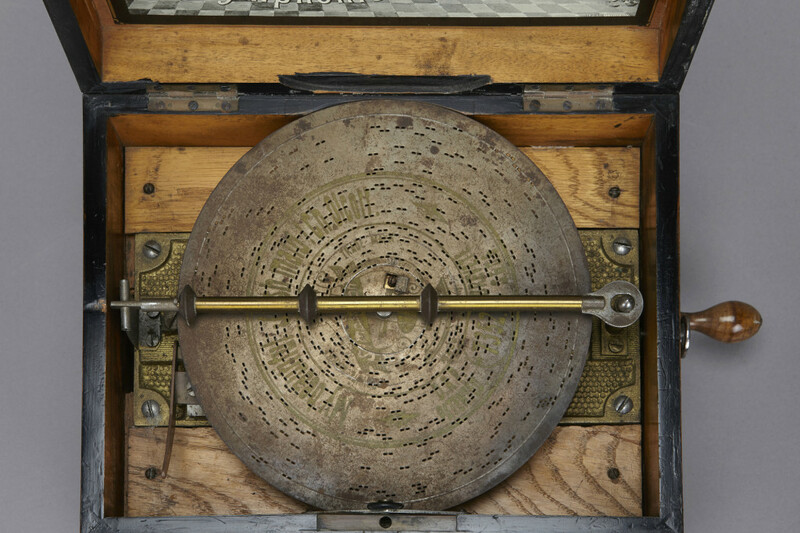 A pocket-sized phonograph and a symphonium – which plays music encoded on punched metal disks – were among the assorted mechanical, musical contraptions on display. 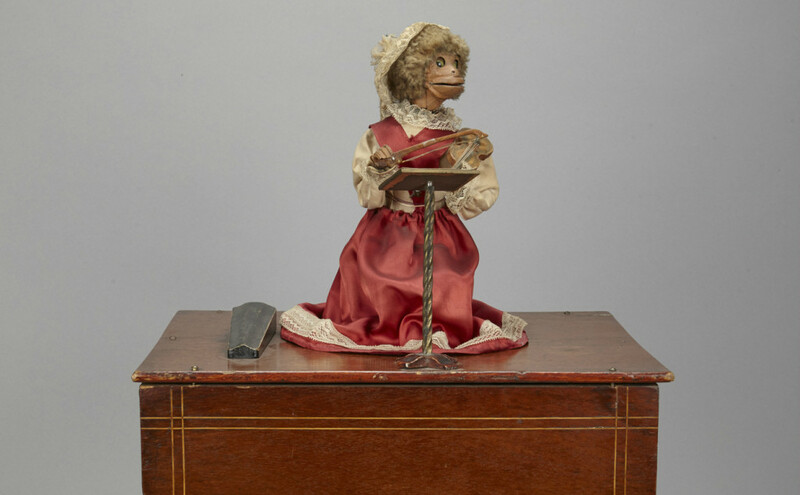 My favourite exhibit from the museum stores was a tiny music box, topped with a fiddle-playing monkey in a dress and lace bonnet. A few contemporary makers were also asked to display their work. Owl Project were comissioned to make a light-controlled synthesizer, inspired by the Soviet Variaphone of the 1930s. Driven by battery-powered clocks, Paul Gittins’ Oak Apple Orchestra tapped a cello in beautiful, phasing polyrhythms. Meanwhile, Morton Underwood exhibited two giant horns which you could put to your ears to boost your hearing. These horns could also be swivelled around to vary your perception of sound coming from different places in the room. Behind the scenes, Colin Uttley and I have been revamping and automating a table-top pipe organ over the last few months. It’s more traditional than our usual fare. We’ve been designing it with parties and fetes in mind. Later on this year, we’ll be hiring it out like a pneumatic, travelling jukebox – it plays covers of disco and electro classics, as well as classic carousel music. We were delighted to be invited to debut the organ in this exhibition, which it flooded with sound once an hour. More details about the organ and its development coming soon, along with some video clips. Read about my work in the Moog Sound Lab which also visited Birmingham during Supersonic. The symphonium and Morton Underwood’s listening horns (The Amplifier) are two of the machines here that work without electricity. Others, including the Optikit from Owl Project and my own automatic pipe organ, use a combination of mechanical and electrical parts. Meanwhile, the synthesizers of Bob Moog, which can be seen in the travelling Sound Lab, create sounds through purely electronic means. Despite these differences, all the works on display are concerned with embodiment – the way sound emerges from certain materials, circuits and mechanical parts. This distinguishes them from virtual instruments (the kind that run on a laptop). If it’s made in software, the mellow buzz of a filtered sawtooth wave can sound very clean and steady – the laptop’s size and shape and the peculiarities of its body won’t have any effect on this. But when this sawtooth is created by light shining through the spinning disks of a 1930s Variaphone (one of the inspirations for the Optikit), the slightest changes in light levels or in the rotational speed of the disks will create a subtle unevenness of tone. This tells you you’re listening to sounds arising from a physical process. Similarly, a sawtooth from an organ will start with a tell-tale husky ‘chiff’ as air is let into the pipe. It’s interesting to see how today’s music machine creators are reinventing ideas from the past. As they strike a drum skin, Paul Gittins’ mechanised oak apples echo those drum-playing automata of the nineteenth century. The paper disks of the Optikit remind us of makers from the past who encoded tunes in the metal disks of the symphonium. And if you listen to the world through Morton Underwood’s giant horns, you may be reminded of old gramophones and brass band instruments. Salvaged from two old sousaphones, the horns have a pronounced filtering effect that colours the sounds as they’re amplified. Whether you think of them as imperfections or lucky accidents, complications like these often arise when building sound machines. It’s not surprising that makers rely on trial and error, led by their ear. It might be easy to draw a clockwork mechanism to strike a bell. But you have to build it to find how sweetly that bell will ring. So why do we go to the trouble of building these machines? Some fulfil our desire to perform music that’s beyond human capability, such as the polyrhythms of the Oak Apple Orchestra or the lightning riffs of the automatic pipe organ. Some attract us because of the way look or how they feel in our hands. Others offer a new species of performance, infused with randomness, that might develop, falter or surprise us as it unfolds over time. I’ve noticed how seasoned video gamers will watch early music machines in a state of childlike wonder, even though these devices can do far less than the characters on a screen. How odd that in the era of virtual instruments and intangible, shape-shifting avatars, these electrical and mechanical beasts seem so special. 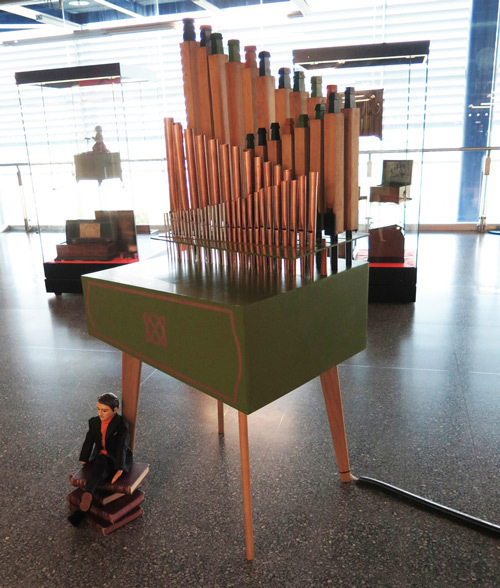 As it clicks, wheezes or whirrs away, a mechanical music machine can sometimes seen uncanny. It’s an inanimate object that seems to have a life of its own. The ANS Synthesizer which influenced the Optikit builders had this uncanny quality as it sonified drawings etched onto a blackened glass plate. When it was first seen in the late 1930s, its otherworldly sounds were associated with occultism and accessing other realms.